An average aquarium cleaner house-sits for a gigolo, only to be forced to become one himself. Archie Moses: Hey, Man! What are you doing? You just wasted good weed! 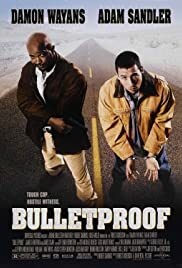 I think Bulletproof may be a better movie than Billy Madison, but outside that it's the worst Adam Sandler movie yet. First there are quite a few scenes of dumb dialogue none of which are funny. And second this movie has some bad action sequences. In the end this movie can't seem to make it's mind if it's an action movie or a comedy and who really cares. *1/2 out of **** for Bulletproof!